Now in stock – Deflecto products. Great solutions for your point of sale materials. 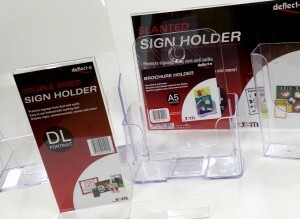 Different sizes available from business card holders through to A4 sign holders. Prices vary, so give us a call on: 83912466 or send us an email: sales@hillscolourprinting.com for a quote!